Appointments available mornings, evenings, and Fridays! Since returning from practicing dentistry on Wall Street in New York City, Dr. Tim has been instrumental in guiding business growth and adoption of new technologies at Yosemite Dental Care. A Mariposa native, Dr. Tim also enjoys backpacking, travel, playing the violin, and cooking delicious culinary dishes. Yosemite Dental Care is proud to welcome Dr. Allen Kim to our team and our community. Dr. Allen was born and raised in Southern California, but spent much of his childhood camping in Yosemite. He fondly remembers taking pictures with the local “Talking Bear” on every trip. Dr. Allen graduated from Loma Linda University School of Dentistry in 2017. Dr. Allen enjoys traveling, being outdoors, playing golf, and spending time with his wife and two cats. Mariposa's 2015 Business Man of the Year has been practicing dentistry in Mariposa since 1984. Aside from his many educational and professional achievements, Dr. Tom enjoys hiking and photography, as well as spending time with his first grandchild. When he’s not busy handling the complex dental cases of Yosemite Dental Care, he dreams of someday hiking the John Muir trail. Very attentive and personalized to his patients. Clearly explained the procedure prior to and explained potential symptoms of discomfort after. Very pleased with care, performance and overall experience. Regular dental cleanings are a crucial first step in maintaining good oral health. 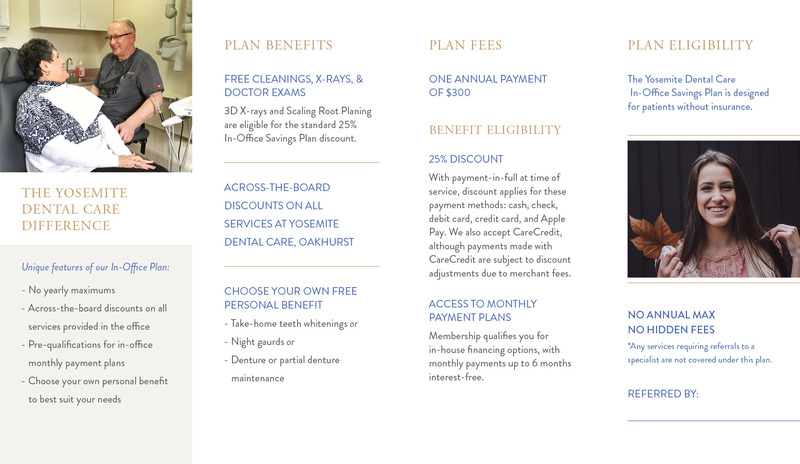 At Yosemite Dental Care, we do our best to minimize the out-of-pocket expense of cleanings for all our patients. If you don’t have dental insurance, be sure to ask us about our In-Office Savings Plan, which can provide you with affordable and consistent access to preventive care at our office. Nothing stands in the way of achieving your optimum oral health at Yosemite Dental Care! All cleaning appointments at Yosemite Dental Care include thorough doctor examinations and quality time with your dentist. If regular doctor exams aren’t covered by your insurance, it’s “on the house!” Yosemite Dental Care believes that we can make the most of every opportunity to monitor and educate our patients about their oral health needs. During your cleaning appointments, a doctor will always be there to talk with you and answer your questions. At Yosemite Dental Care, we provide metal-free dentistry. State-of-the-art resin composite is the only filling material used in our office. Say hello to a new white smile, free of toxins and metals. Crown treatments are now possible in just one appointment, thanks to our CEREC system by Sirona. Get beautiful, metal-free, all-ceramic crowns at Yosemite Dental Care. All of our crowns are computer designed in our office and can be installed in your mouth the same day—no temporaries or second visits necessary! Dentures and partials are a great, affordable option for replacing multiple missing teeth. Get the most bang for your buck with a full-spectrum prosthesis: custom fitted, designed, and fabricated. Enhancements are available for existing dentures, including everything from new soft liners to implant retention. Yosemite Dental Care is committed to using esthetic and biologically friendly materials. Whatever your procedure might be, you can be assured that our doctors will always help to provide you with the best esthetic results. Most importantly, we will always let you decide which dental materials best suit your needs. Individuals who have been self-conscious about their smile now have the option of a complete dental makeover. Integrating various dental technologies and extensive dental training, Yosemite Dental Care can give you the smile you’ve always wanted! A simple way to brighten your day and your smile! Yosemite Dental Care provides in-office and at-home options for whitening your teeth — a quick way to beautify your smile before a special occasion. The ultimate expression of modern technology in dentistry, dental implants are the most life-like replacement for missing teeth. Surgical-grade titanium implants allow our doctors to create the foundation for new teeth without damaging adjacent teeth or creating areas which trap food and are difficult to clean. The doctors at Yosemite Dental Care are qualified to extract impacted wisdom teeth and save you a trip to the oral surgeon. We don’t believe that every wisdom tooth is bad, but we can advise you whether yours or your child’s 3rd molars could present a problem in the future. Don’t forget to ask about our sedation options! Oral Conscious Sedation has become a preferred option to remove the stress of many procedures in dentistry. Oral Sedation has nothing to do with pain, but everything to do with your mental game. With painlessly administered oral medications, Yosemite Dental Care has the best options to fit your needs. 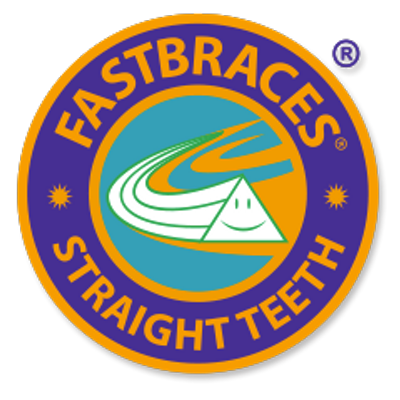 FastBraces is a safe, fast, and affordable alternative to traditional orthodontic treatment. We finish 90% of our orthodontic cases in less than 6 months. Schedule a free consultation to find out if FastBraces is right for you! ClearCorrect is the solution for straightening your teeth without brackets. Clear aligners are invisible and can be removed while eating, making ClearCorrect the “Clear Choice” for appearance conscious patients. Retainers are included at the end of all our orthodontic cases. If you had braces at another office and simply need new retainers, we are happy to help you with that at an affordable cost. We make clear, wire, and permanent retainers!